The government of Georgia has admitted that major mining companies in the country, RMG Gold and Copper, within the Rich Metals Group registered in Netherlands, pollute environment in the east of the country. Georgian Agriculture and Environment Minister Levan Davitashvili stated in Parliament on Tuesday that the inspection conducted by his body in 2015-2016 confirmed air, ground and river pollution in Bolnisi region, causing serious damage to local environment and people. The statement caused a confrontation in parliament between former and current ruling team members blaming one another about “showing a blind eye” to the problem for years. 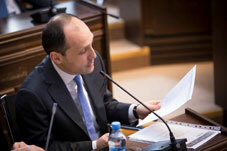 Davitashvili stated that the companies must cease polluting the environment and the Mashavera, Poladauri and Kazretula rivers in Bolnisi and arrange a relevant infrastructure. The Rich Metals Group was given a "reasonable” time of 9 months to suspend the pollution of the Mashavera River and six months to arrange relevant infrastructure to prevent the pollution of two other rivers, Davitashvili stated. The minister said that in one month’s time the company must reveal a plan on how it will carry out anti-pollution activities. The ministry inspected the whole territory of the RMG Gold and Copper, 1,228 hectares in total, in the wake of the Rich Metals’ Group statement that they had acted within an environment protection plan elaborated with the support of international experts. Rich Metals Group is one of the largest enterprises in Georgia and in the Caucasus region, employing 3,000 people, 90 percent of which are locals. The company’s official web-page reads that in 2011-2014 it invested about $ 300 million in Georgia. RMG Copper and RMG Gold produce copper concentrate and gold Dore alloys by mining and processing copper and gold containing ores. “Big international trading companies buy RMG products. 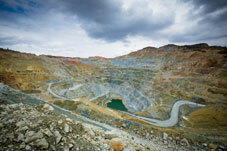 The traders purify the purchased products and melt the pure metals (gold, copper, silver) in the metallurgical plants. Later on, the pure metal is sold on the London Stock Exchange,” the webpage reads. In 2013, the Georgian Dream leadership removed the status of cultural heritage from Sakdrisi, 20 kilometers from Bolnisi, which could be the oldest gold mine in the world, and allowed the RMG Gold resume mining activities there in 2014. Former Prime Minister Irakli Gharibashvili stated that the government “took the interests of the local”, considered the population when making the decision over letting the company mine in Sakdrisi.